I have had a busy week trying to squeeze in a lot of things since my hubby and boys are gone on their annual fishing trip. I have spent a lot of time with my daughter, daughter in law and the 3 grand babies...so much fun! I also made a quick visit back home to spend some time with my folks. I did managed to squeeze in a little bit of crafty time to, yay! This week has just flown by...can't believe it's Friday tomorrow, yikes! So, today I have a pretty card to share today using some fun stamps and dies from My Creative Time. 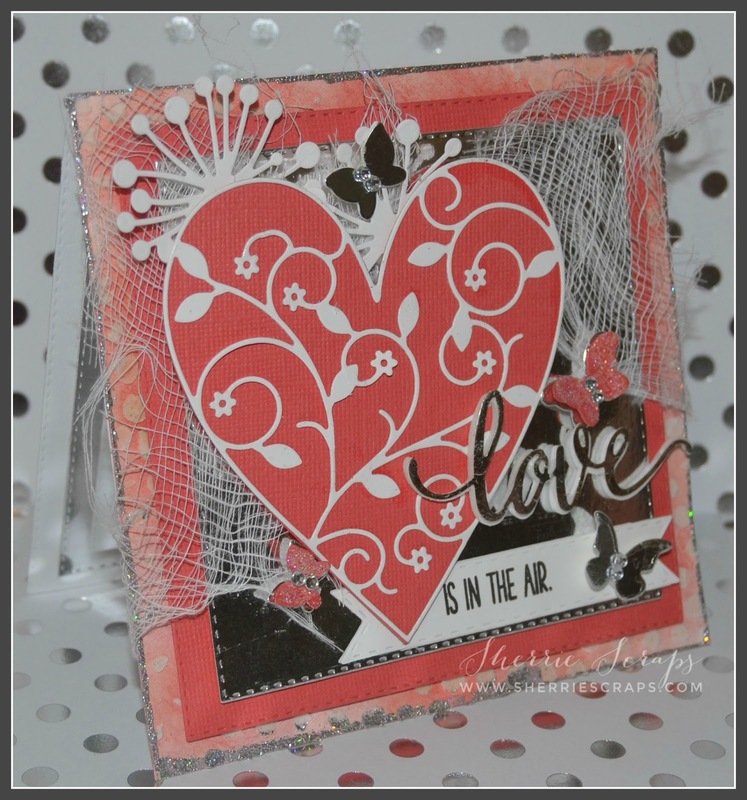 I used the Stitched Squares Inside & Out die set for the base and base layers of my card. The base is water colored with tattered rose and victorian velvet. The outside edges are embossed with Sweet Stamps~Fantasy Silver. I then used TH layering stencils and texture paste to add texture. I then followed with the next two base layers and then with foam tape adhered the heart in place. The gorgeous heart is Memory Box~Glorious Hearts and Vidalia Heart dies. I just love the Vidalia~so intricate and delicate. Tucked beneath the heart is tack cloth and Memory Box~Chandra Stems. The sweet little butterflies are My Creative Time's~Mini Butterfly dies and some covered with Sparkling Ice glitter. 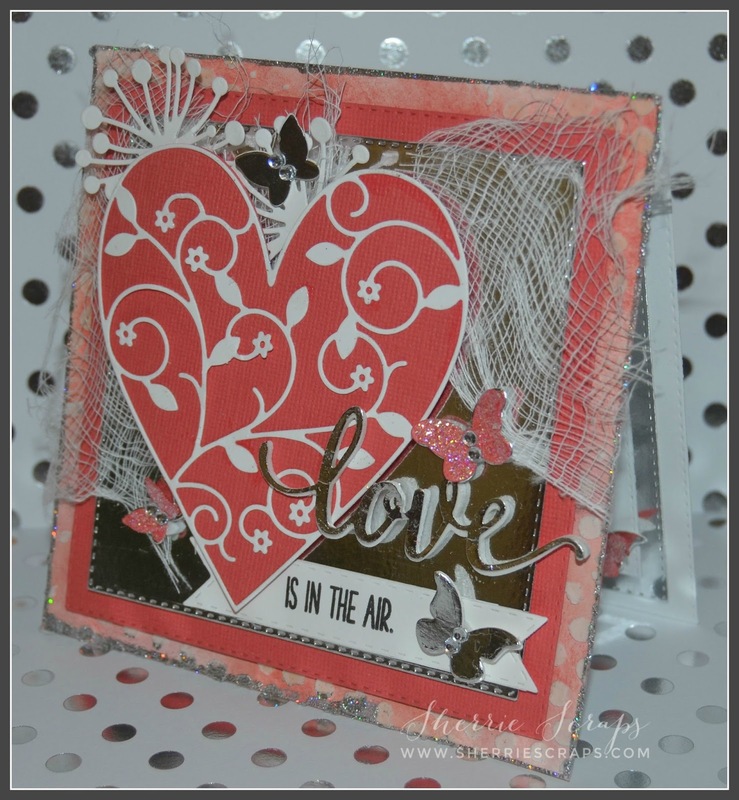 The love is My Creative Time's~Love die and the sentiment is from The sky is the limit stamped onto a Vintage Stitched Label die. This is absolutely stunning, Sherrie!! I love the hearts...adding those dies to my wish list!! You've accentuated them beautifully!! I love the butterflies fluttering about and the colors!! This is so elegant and gorgeous my friend!! I love, love it!! Thank you so much for playing along at DL.ART!! What a gorgeous card Sherrie!!! 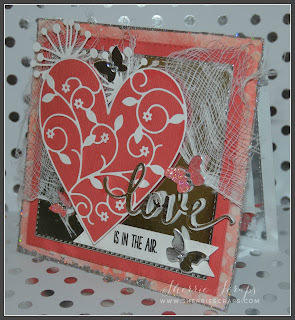 I just LOVE the colors, the texture and those stamps and dies! Such a elegant card Sherrie. Love the dies and soft pink colors the touch of glitter is perfect. Awesome dies used and a must have on anyone's wish list. Love it. I absolutely love the touch of gold! !I love the pretty butterflies and the beautiful memory box glorious heart die!! 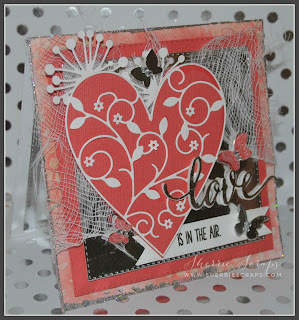 Beautiful card Sherrie!I love the colors and die cuts. Wonderful design! Oh Sherrie I love the colors of your beautiful card! That heart die is gorgeous! 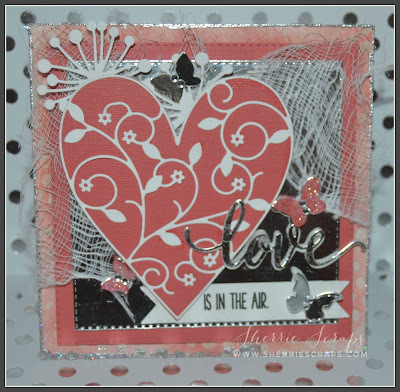 I love your silver butterflies and the cloth adds so much to your card! Thanks for joining us at DL.ART June Linky Challenge! This sure is pretty. I like that you have been using some different techniques and crafty supplies. It keeps it fun, huh? I haven't used this paste yet. Is it easy to work with? What do you still want to try? Sometimes I get overwhelmed because there are so many things to try. This is gorgeous! I am loving the colors and that big heart!! And YAY! for grandbabies time!!!!!!!!!!!!!!!!!! Beautiful card, Sherrie!! Love the little butterflies and that gorgeous heart!! Have a great day. Beautiful card Sherrie, love the colors and the use of the "tack" cloth?? Oh, how beautiful! I love the swirly heart, and my favorite part is the white dandelion sticking up from behind! I love it! Just beautiful. This is so pretty, Sherrie! The tack cloth is a fabulous touch! I'm so glad that you've been able to spend time with your loved ones while the boys are away! Sounds like fun!! So many pretty details on your gorgeous card! It's truly a work of art. Thanks so much for joining us on Let's Craft and Create. Wow Sherrie this card is so gorgeous! I really love all that texture and the design of the card. Such a beautiful card.... you should be very proud! I am glad to hear that you were able to make a trip home to see your parents.... and I hope that visit went well ... and having quality time with your precious grand babies and their moms is just a huge bonus! Enjoy your week my friend! It's absolutely gorgeous! I love the colors and that heart... its beautiful! I love the tack cloth it super neat! Sounds like a fun week, I hope you are getting some nice weather. We went from overcast to HOT! It's so weird when the beach hits 90, but I'm not complaining. this card is beautiful my friend. I can't believe how much you fit in to the time your hubby & boys were on a fishing trip! Hi Sherrie! Oh WOW! This is simply BEAUTIFUL! Glad you've found things to keep you busy while your hubby is on his trip! I've managed to keep busy too with my son being home on leave.... We take him to Vegas this next week... and I have family that'll be here today - and of course my computer decided to take a nice crash... UGH! I think I finally got it up and running, so I'm able to visit my Favorite blogs again.. Boy I've missed that! Love seeing the different card style you've been doing... looks wonderful! Have a great week! This is so fabulous! I love all the amazing details and textures on this beautiful card...love, love, love!